I admit it, I’m completely biased, but I reckon the cars adhering to this formula were peerless from the point of view of “pure racing car” looks (well them and the cars of International 1.5 litre Formula One!). 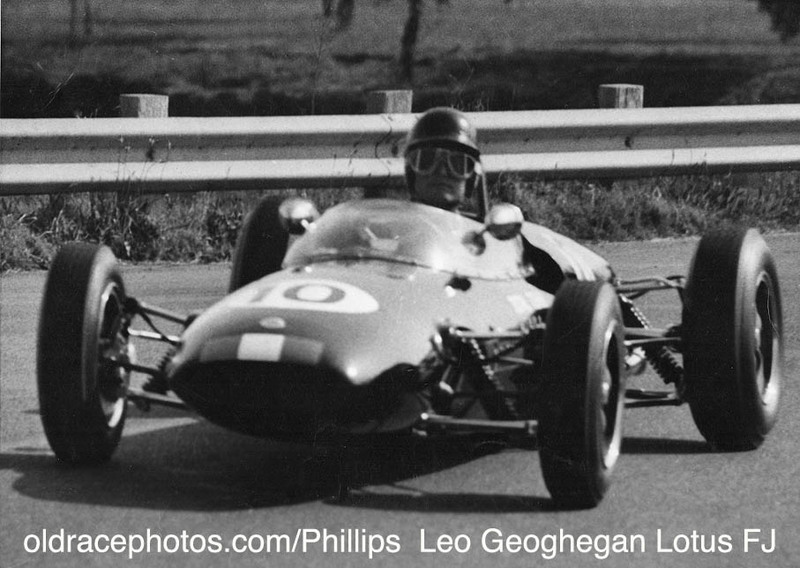 John Ellacott’s photo of Leo Geoghegan’s stricken Lotus 27 from the inaugural National Championship meeting at Warwick Farm in 1964 does it for me on many levels. I’d love to use this thread to document a race report of all the national and state championship races over the four year period that cars were fielded for this formula. Alas, I don’t have an extensive enough library to manage them all, but I’ll make a start when I can! Edited by SJ Lambert, 21 September 2018 - 08:53. They nibbled at the heels of the 2.5s and trounced the slower ones, while there was often first-class dicing between the main protagonists. 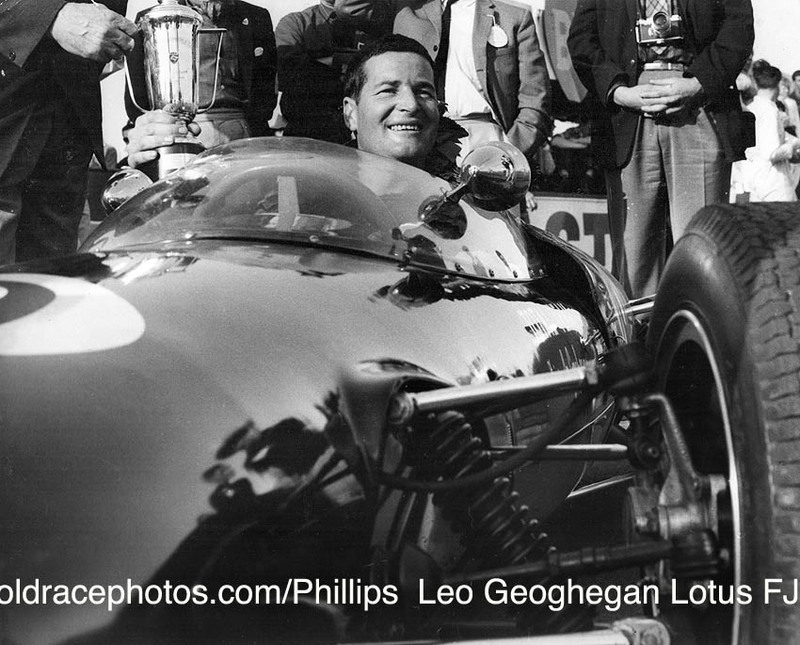 One of the big things about the formula was the Joseph Lucas-Lex Davison series run at Calder. Of course, Elfin Monos went very well at Calder. I really like that one James - great sense of movement. Clean off the stringy bits on the slide, metho on tissue, the slide emulsion will be hardened after all this time, and then use photoshop, and you've got something good there. To help with what James hopes to achieve with this thread, (if I'm on the correct track) these are the ANF 1 1/2 litre Championship events - with many other smaller events for the cars to participate during the same period. For interest here are a couple of my own personal photos of that meeting that were very kindly put up for me by Ray Bell on post #38 of the attached thread. They were taken with my "mighty" Instamatic. Leo in 'civvies' on race day, probably talking to Glyn Scott as much as anything prior to Bruce Burr preparing to push Greg Cusack's car forward to go to the grid. That would be the Arnold Glass 27 the other side of Scotty's, Collerson's Brabham is obscured and then the Price 18 sticks out. Greg Cusack enjoying the spoils of victory, Bruce Burr off to the left. Geoghegan and Cusack, as above, were the principal protagonists in the 1st division to begin with. NSW, Qld and major races were the province of these runners, those with the very quickest cars all-round with Bib Stillwell stepping down from ANF1 'to get some track time in' and gave them some 'hurry-up' for a short time. In time John Harvey, Kevin Bartlett and Max Stewart joined these ranks. The cars were principally Brabhams, but Geoghegan's Lotus 27 and 32 mixed it in there and did a lot of winning too. 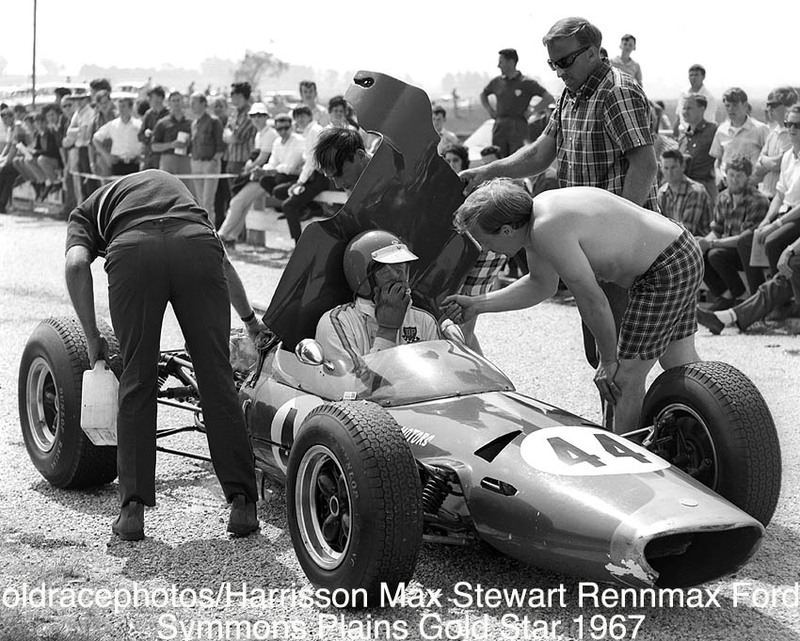 Stewart's Rennmax was, of course, virtually a Brabham replica. Then there was the 2nd division. Led by Elfins, of which the Mono became the main one until the birth of the 600 in 1968. Their playground was the Calder Lucas-Davison series and Mallala. Dominance in those fields belonged to them. Unless one of the 1st division cars made a serious attempt to challenge them. There were those (Bob Jane, Mel McEwin, Garrie Cooper, Ian Cook) who stepped out of their 'comfort zone' and campaigned against the 1st division cars on their home turf. Often they filled minor placings, rarely were they really competitive. 1. Sandown Park International meeting, 1966 supporting race. 2. 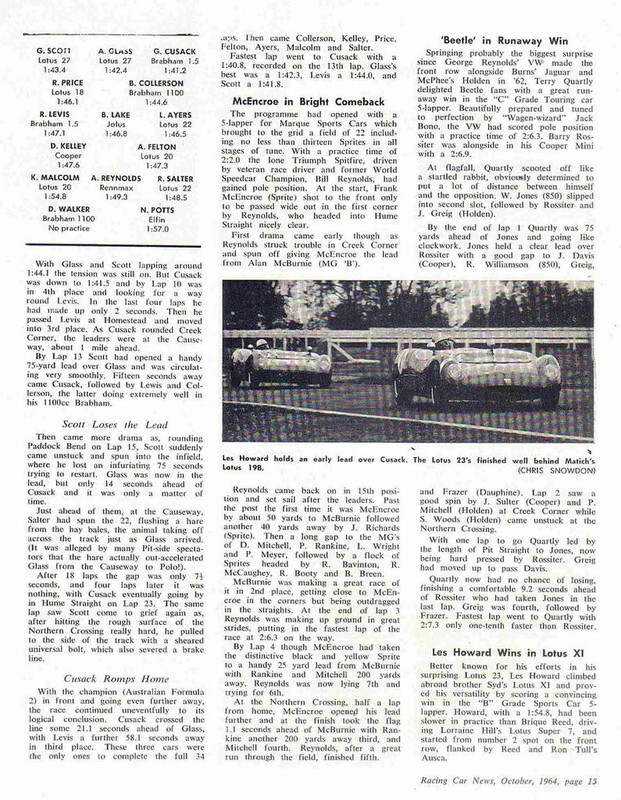 Warwick Farm ANF1½ race, May 1965. 3. Catalina Park January meeting, 1964. This is one of only two occasions I can recall Leo pranging a car, but I could be wrong. The other crash I recall was when he rolled a Valiant Charger at Amaroo. 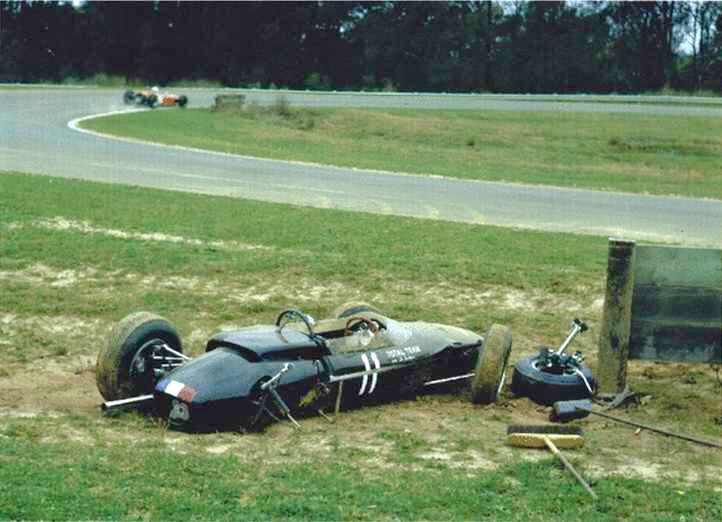 An “incident” with Leo was when the right front wheel of his Lotus 39 came loose at Longford and rolled down the track. He brought the car to a stop without damage. And there was a couple of Pacer crashes, I'm sure. But this is getting away from the purpose of the thread. I don't recall those Ray. Do you have more details? That means I'm away from home working and therefore unable to look up details. 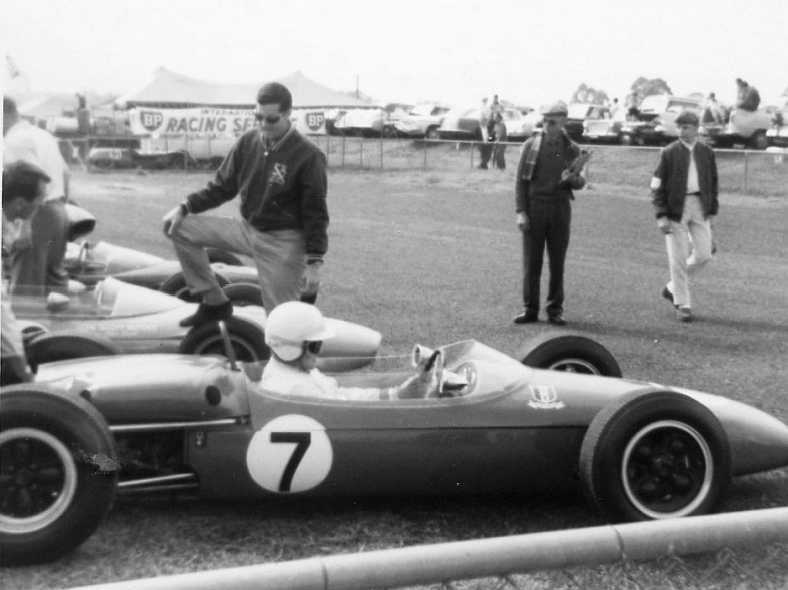 Ray perhaps you may be thinking of the time that Bernie Haehnle took the Lotus 39 for a test run at a wet Amaroo and proceeded to prang it. 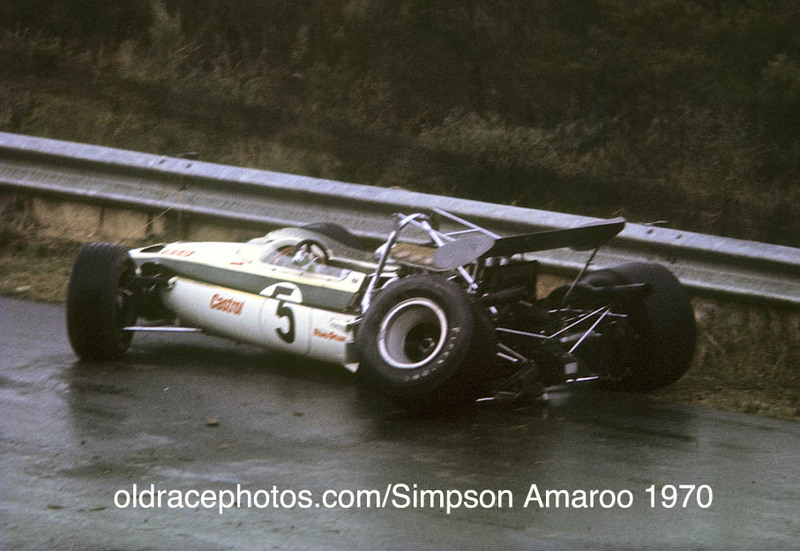 The Bernie Haehnle accident was in 1970 and did a reasonable amount of damage to the rear of the 39, both back wheels skew whiff and maybe damage to the gearbox. 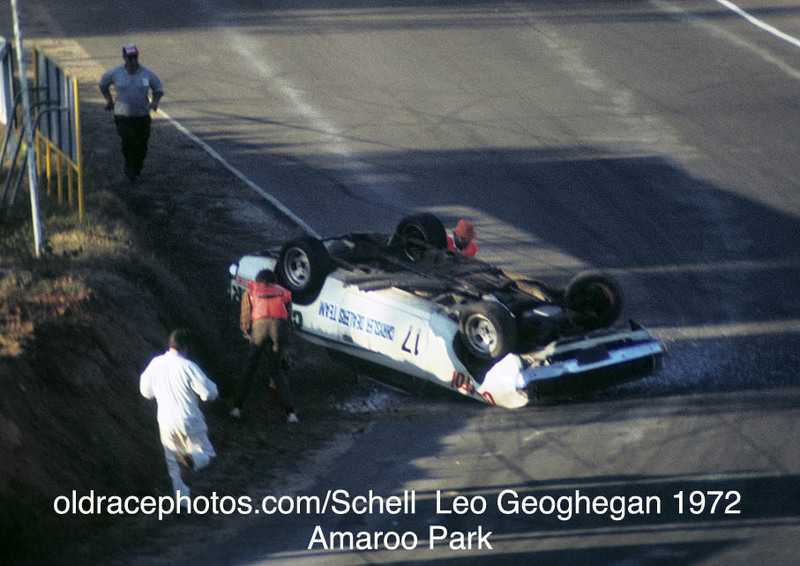 Leo flipped the white Pacer at Amaroo in 1971 and the white E38 Charger in 1972 - we have a shot of the Charger on its lid on the ORP website but nothing of the Pacer crash. 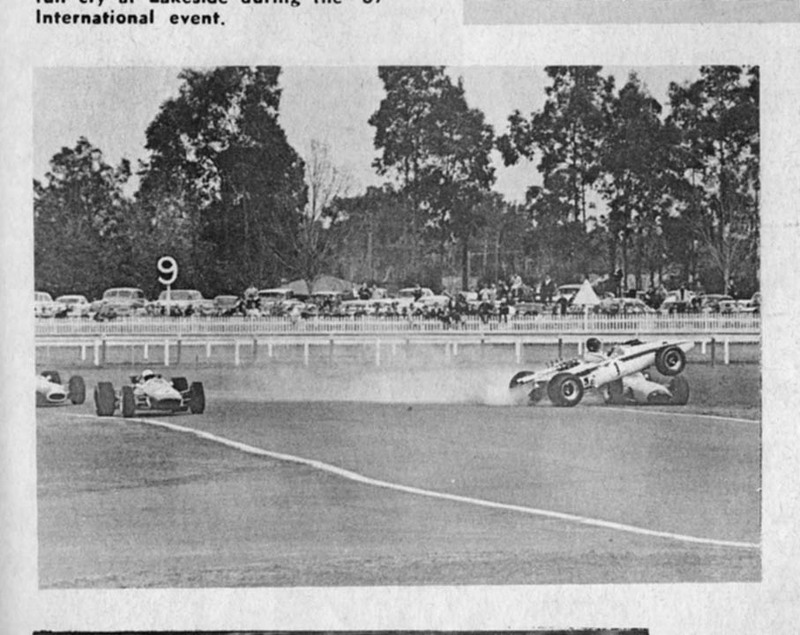 The Lotus 39 with front wheels up was at Warwick Farm in 1969 from memory - pretty sure the shot was in RCN - will check. However, we all seem to be forgetting the big one Leo had at Bathurst in '68. I've no knowledge of his Bathurst crash I'm afraid. 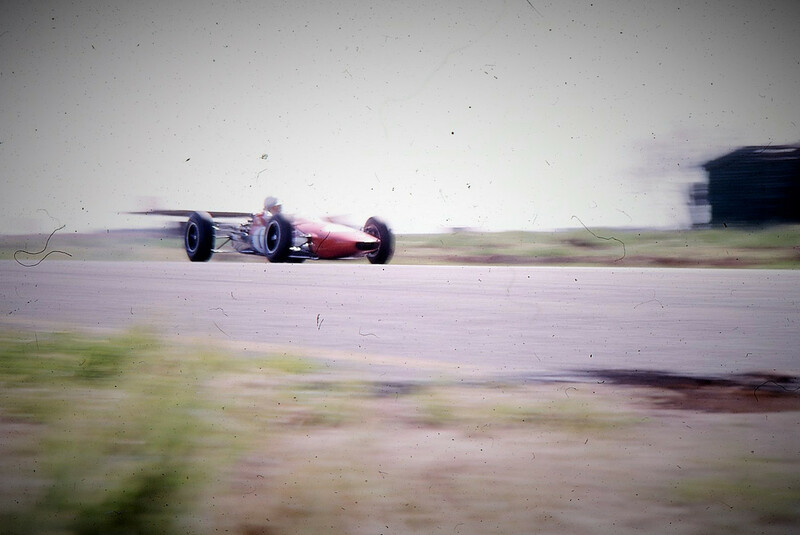 However, I have uncovered the nose in the air shot from W Farm in 1967 after tangling with KB. Amaroo accident with Haehnle looks a bit worse than I remember. Edited by ellrosso, 02 October 2018 - 10:01. 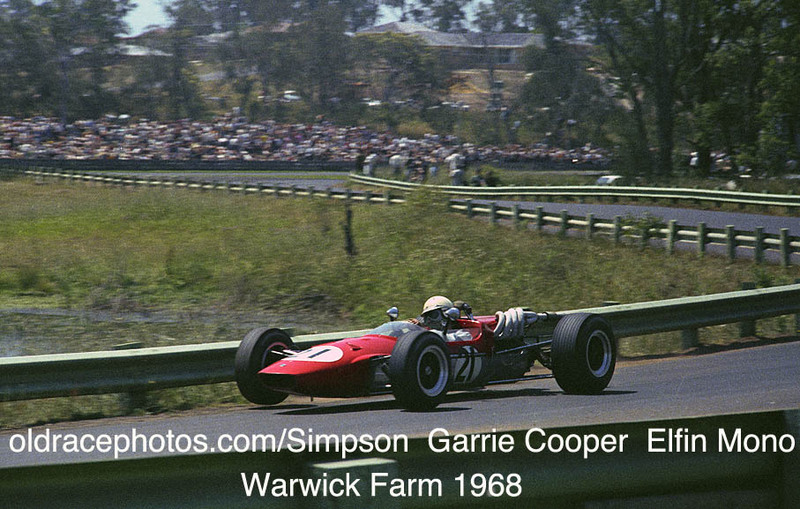 The Easter '68 Bathurst crash was on the practice day, the same day as John Harvey was badly hurt in the Jane Brabham. Leo clipped a tree at Reid Park and did considerable damage to the car, bruising his leg and straining his ankle as he did so. And all of this stuff is simply not relevant to the title of this thread. A couple of shots to get back on thread - no info though I'm afraid. The second is obviously heading out of the Esses at Warwick Farm. They must be 1962 or 1963. Australian FJr Championship race, September 1963. 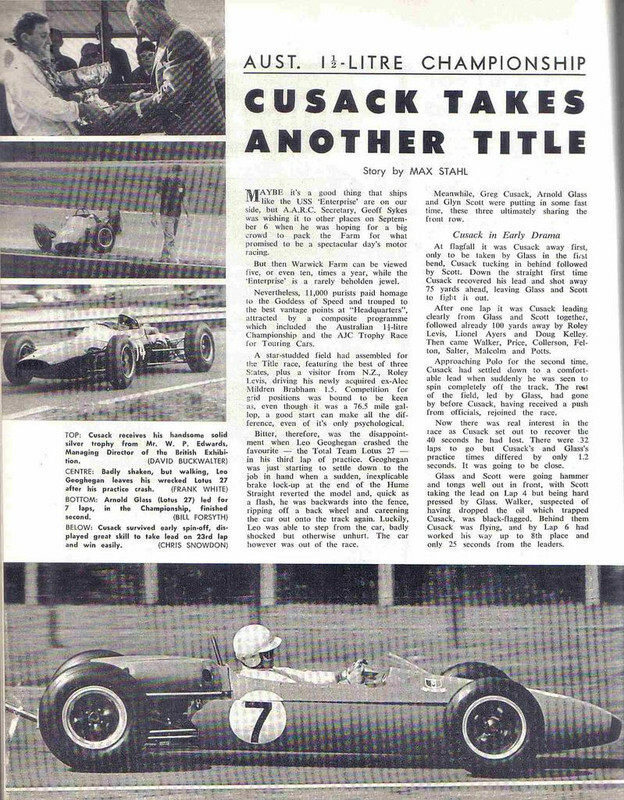 Leo won from Cusack sustained challenges from Palmer in the ex-Cusack Elfin and from Cusack, set the lap record for FJr. Once again, however, it's not ANF1½ racing. Edited by Ray Bell, 03 October 2018 - 20:40. With the greatest respect those photos are not back on thread. The cars are formula junior and are not in thread period. While it's true that ANF2 continued with FJr rules and capacity, the leading lights in FJr were already racing in 1.5-litre versions of the Juniors. Which is why ANF1½ became so successful so quickly. It was the era of the Elfin Mono, which won incessantly at Calder and Mallala. We may have already discussed this point elsewhere, I don’t quite recall, but in 1968 when Garrie Cooper and Max Stewart shared the championship in their respective Elfin 600B and Rennmax, did Garrie use a Mono at all in the championship? I doubt that I'll be able to check this for a week or two. I'm away from my RCNs most of the time at the moment. I had a notion that for that year the Gold Star and the ANF2 title ran concurrently, and so it proved to be. Max won the class at Bathurst and Surfers while Garrie won at Sandown and Mallala. Second places fell to Max at Mallala and Garrie at Warwick Farm. Neither scored at Lakeside, and it's clear Garrie wasn't even at Bathurst as that was the same weekend as Singapore. It may be that neither went to Lakeside, but I cannot see Max having missed that one. Anyway, the Mono wasn't a winner as the series began the same weekend as Garrie started racing the 600. 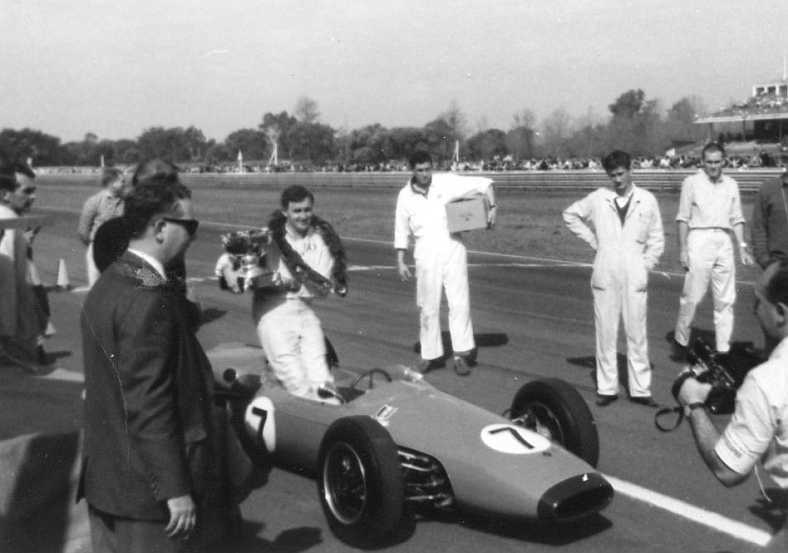 One round did fall to a Mono, John Walker's class win (and fourth outright) at the Farm, while Lakeside went to Ian Fergusson's Lotus 27 (fifth outright). That’d be nice, but it’s beyond my abilities from home! I’m concentrating on identifying notable Mono achievements and some of the exploits of the likes of Cook, Costanzo, Cooper, McEwin, Walker & co. whilst piloting them. As you’ve said earlier Ray, the Lucas-Davison series was certainly a Mono playground! I actually read the RCN race report from the Farm earlier today, Walker’s class win robbed Garrie Cooper of a stand alone championship win! He's still in the record books, even if it's a shared title. Ray, did the Lucas-Davison series mirror the ANF 1 & 1/2 formula from 64 to 68? Who were it's recipients? The 1100cc class, whether it started as FJr or was ANF2 from the beginning I don't recall. And the ANF1½ category. Participation by the NSW 'heavies' in these classes was limited, so it was mainly a Victorian and South Australian series. I don't know how you'll find the series results without going through the late-in-the-year RCNs. Or Autosportsmans or AMS in the earlier years. I think it was Cookie in 66 & 67, then Alfie in 68. Not sure about any others.